I’ve embarked on a little psychological experiment. Which is the more dominant trait: patience or frugality? I think I know, but in the hopes of saving a little hard-earned money, I hope I’m wrong. Anyone who has worked with me knows I take out a lot of frustration on my computer mouse. In fact, I’m so hard on them that I try to keep three or four spares in my desk or at home. It’s a necessity for someone who works on deadlines. I don’t always have time to run out to buy a new mouse after the one I was using dies … or becomes a victim of homicide. My mouse and I have a love-hate relationship. I love it, until it gets clogged and slows down. When you get a new mouse, it is clean, and it works quickly … without lulls or delays. It’s a beautiful thing. But after three or four weeks of running over dust and crumbs and other foreign objects on my desk, it starts to slow down. And that’s where the banging comes in. Often, the mouse isn’t the problem. It is the computer. The mouse is a scapegoat. I know that. But the computer is worth a lot more than my mouse. And despite how much I’d love to chuck my computer out the front door of my office into traffic, I can’t. So I bang and thump that mouse on my desk. And that leads to more delays and more anger and more banging. It’s a vicious cycle that can go on for days. The banging becomes louder and more forceful, as does the muttering under my breath. In a week or so, it’s time for a new mouse. I’m a creature of habit. I know how I am. I rarely pay more than $6 or $7 for a mouse. When I worked at the Mansfield News Journal, we downsized … a lot. And that meant a lot of spare “mice” from computers that no longer were needed. For a couple of years, I never had to buy a new mouse. Those days are long over. Now I buy my own work “mice.” My employers shouldn’t have to pay because I have a temper tantrum at my desk once, or twice — OK, maybe six or seven times — a week. I’ve worked at the Galion Inquirer for about a year. I’m on my third, perhaps fourth, mouse. My latest mouse died Tuesday afternoon. It was not a pleasant death. In fact, it came apart on me and one of the pieces flew across the room. I had to rush to pick it up before the dog swallowed it. Fortunately, the Wednesday edition of the paper was almost done, and I only had to use the touch pad on my laptop for maybe 30 minutes. After that, I headed to the store to get a new mouse. I looked at the $5 “mice.” Then I spotted a brand I am familiar with, and it was a color I liked. (Yes color is important when choosing a compatible mouse). But it was almost $20. I weighed my options: Four cheap mice, or one nice mouse. For the first time, I picked the more expensive mouse. It likely will turn out to be the wrong decision. I know I sound like a crazy person at work, muttering under my breath and slamming my mouse on my desk. They say patience is a virtue. Perhaps so, but it’s a virtue I have trouble with. I’m a good listener. I can keep secrets. I have compassion. I show empathy. I struggle with patience at work, and at home, when I’m in my car, when I’m waiting in the checkout line at the grocery and even in the not-so-fast food drive-thru line. Seriously, how often does that breakfast menu change at McDonald’s? I even struggle with patience when I’m out doing something I really enjoy … golfing. Fortunately, the crew I play with don’t read a lot of my columns. But seriously, if it is your time to tee off, finish that story later. Choose your club, test the wind and check the yardage … before you step up to the tee. Finish that hot dog, take a sip of your Bloody Mary, take a toke off that stinky cigar while the rest of us are teeing off. Perhaps my impatience on the golf course stems from the fact I’m almost always the last one to hit off the tee. Translation: I had the worst score on the previous hole. You’d think I’d get used to that. I can deal with losing of the golf course. I’ve been doing it for 40 years. The first tee-shot I ever hit — on the first-hole at Galion Country Club — was a duck hook into an open storage shed about 50 yards in front and 30 yards to the left of the No. 1 tee. What a racket it made. But the noise was a lot less than the high-pitched voice of greens superintendent Gordy Caldwell, who about had a heart attack when that ball ricocheted around that shack while he was working inside. So I can deal with bad shots. My problem is a lack of patience. Computer “mice” and I have never been great friends. We reluctantly co-exist. We had to. I needed a mouse and my mouse needed me to get it out of that unbreakable, impregnable piece of plastic it came in. I am on my computer at least eight hours a day. Usually more as I also use one to chat with old friends and new friends in the evening. In fact, I met my wife in a computer chat room. If I get married a second time, I’m sure the computer will have played a role in that relationship. Hence, my love-hate mouse relationship. So, on Independence Day, I made a resolution. I resolved to no-longer blame my mouse for my lack of patience. It’s an inanimate object. One that is trying to make my life easier. It never hurt anyone. It’s doesn’t deserve the painful, awful death it will experience in a few weeks. So I’m turning over a new leaf. It’s a test that student psychologists or student sociologists night study in college one day. Which is stronger? Anger and impatience, or frugality? I think I know the answer. I already purchased a spare mouse. 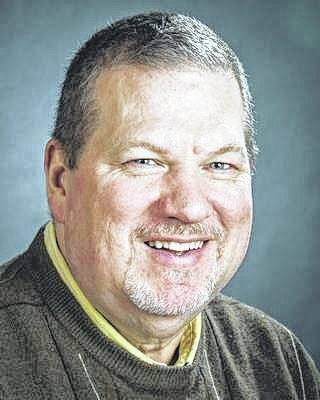 Russ Kent is editor of the Galion Inquirer, email him at rkent@aimmediamidwest with comments or story ideas.